The #WadGate bandwagon rolls on, with the Daily Boris audaciously claiming “to reveal today” the story which Inside Croydon published last Saturday, five whole days ago – and all based on a Tory party press release, no less. Meanwhile, the whole Fisher affair has gone multi-media, taking to the airwaves weeks before anyone at Tragic FM, Croydon’s answer to North Norfolk Digital, has even managed to work out how to present the matter in a suitably PR-friendly manner. Steven Downes, editor of Inside Croydon, was lured on to the south London bloggersphere’s answer to The Smashy and Nicey Show last Saturday, with the leading hyperlocals from Lambeth and Greenwich, Jason Cobb and Darryl Chamberlain, to do his best impersonation of Whispering Bob Harris and try to explain the ins and outs of #WadGate, and various other dark matters in deepest outer London. 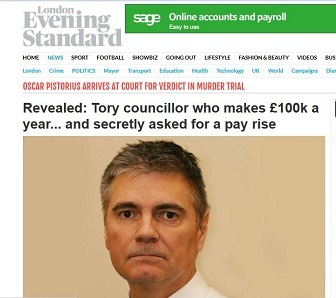 There’s a lot of chatter about Tall Ships, the spending of millions of pounds of public money, some lobbying for Steve Reed OBE to stand for the leadership of the Croydon Conservatives, and how other south London boroughs are actively advertising for new chief executive officers and offering them the princely salary of… £180,000 (Tony Newman take note). Afterwards, Downes was told he has a great face for radio. You decide. This entry was posted in Evening Boris, Inside Croydon, Local media, MetroKnobbers, Nathan Elvery and tagged Conservative, Croydon Council, JASON COBB, Lambeth, MetroKnobbers, Mike Fisher, Tory. Bookmark the permalink.